One of the first note worthy things about my personality is that I absolutely adore Youtube. I’m actually surprised I have yet to write a post about Youtube, but it wouldn’t be a place where I would be talking about my content. I do not make content. Not that I think I don’t have what it takes, by any means, but I just enjoy supporting the current channels that I do watch. Personally, I think my creative talent comes in the form of writing, not speaking. However, talent comes in every different shape and size. It is something that I seek in other’s as an important attribute of their personality. Youtube is a platform that asks for that talent to be released in whatever way the creator sees fit. It is a truly amazing way of expressing yourself. Now, I realize that Youtube has been coming under fire recently for numerous reasons, but this post is merely to talk about those I do support. Mainly, this post is going to be discussing Markiplier. I started out my 2018 by attending his tour in Salt Lake City. Now if you don’t know who Markiplier is… (you need to be more cultured) No, I jest (but really). Markiplier has been a Youtuber since 2012 and has had an extremely popular gaming channel through current times, reaching 19 million followers the last week of December. He is known for his Let’s Play, videos that consists of the player playing a game whilst commentating on events taking place, but Mark has moved to doing comedy sketches, original short movies, and even interactive short stories that allows the viewer to feel more immersed. I respect Mark highly in terms of work ethic and the love behind his channel. Some people who have high followings on Youtube can get in the mindset that nothing can touch them, they don’t owe anything to their viewers, and they are above normal society. Markipler, among the other Youtubers that I watch, are not like this at all. It’s the idea of, “the community got me to where I am today” aspect that I truly find heartwarming inside these Youtube channels. This bring a strong community bond. Along with this viewer/Youtuber bond, it is the charity that Mark displays as a human being that draws so many people to his channel. He has raised so much money towards foundations such as Direct Relief, St. Jude’s Research Hospital, and Save the Children. Markiplier and friends have raised over three million dollars towards charities. That is more than some celebrities give in their life time. I do realize that it doesn’t all come from Mark’s pocket change, but that is the amazing thing! He raises this money through his fans! That $400,000 towards Save the Children came from regular, every day people who watch his channel. Youtube gave him the opportunity to do all of this and I simply find that amazing. It is something that we should be taking more seriously and using our regular social media apps in this positive way. Knowing that people are still living to give to other’s in need keeps me alive. Markiplier always find a way to give back to his community. Last year, he released the news that he was going on tour. This meant he was going to put on shows for his fans all over the world and no show would be exactly the same. As soon as this news came out and the tickets went on sale, I purchased mine instantly. I got a fairly decent seat. Row E, roughly six rows away from the main stage. At the time I was attending alone simply because I wanted to support and go see one of my favorite Youtubers! The show was January sixth at the Eccle’s Theater in Salt Lake City. It was an amazing show that I would have regretted deeply had I not gone. Seeing Markiplier come out on the stage was incredible. I spoke to other fans before the show about how weird it would be to finally “see” him. That we all watch his videos in one way or the other on a phone, the TV, or through some other screen, religiously or casually, and only seeing (most of the time) his upper body… That it was going to be so surreal to see him in person. In no way do I idolize other human beings. In my opinion, idolizing other human beings is wrong since no one at the end of the day is better than any other human. However, seeing Markiplier on stage was like meeting a new friend. Except this friend was a friend that you already knew and cherished. I know this feeling was shared through the crowd. This is just another magical part of how effective a platform like Youtube can be. Many people watch their favorite Youtubers after a bad day, to relieve some stress, to laugh and be entertained. In this way, these faces that we see every day become a friend. It’s a platform where you can even reach out to these people behind your screen and in most cases they can reach right back out to you. Therefore, seeing a person like Markiplier for the first time is so much different than meeting someone like Elijah Wood for the first time. One is a little more attainable and also more relatable than the other. This kind of relationship is what made this show so epic. One, it was a hilarious show. 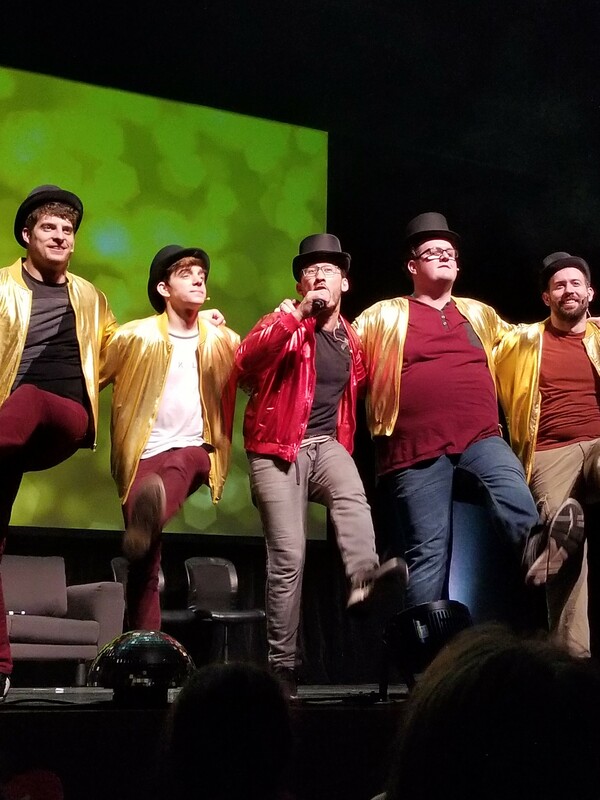 Seeing Mark, Tyler, Bob, Wade, and Ethan all create wonderful stories, jokes, and dance routines up on the spot was awesome to see in person. The fans truly stood up to their name as well as everyone I met there was genuinely kind. As we waited for the show to begin, the fans started having a dance party with each other which really made that “family vibe” set in. At the end of the regularly scheduled show, the group took the time to answer questions from fans which was a lovely touch on this being a personal show. Usually Q&As are available at Youtube, conventions, or panel events but taking the time out to talk to the audience just set the tone deeper that the tour was for the fans. VIP pass holders also got a closed showing beforehand where Markipler performed via guitar. The picture below was the ending of the VIP show in which they sung Smash Mouth All Stars to the audience. (Wade got really into it – bottom right). The title of this tour was The You’re Welcome Tour. Named towards saying “you’re welcome” to his fans, but also saying a big thank you as well as he truly understands that there would be no tour without us. I had an exceptional time at this show and I would honestly love to go to a convention where I could meet Mark and more of my favorite Youtubers. This show was one of the first that I have been to in support of anyone I watch on Youtube. I do want to attend others in the future as Jacksepticeye has been touring on his own time as well. Some may call watching Youtube an unholy obsession (they could be right), but I deem it worthy of my time to watch, support, and occasionally donate my hard earned cash to them to show that I want them to keep on doing what they have always worked so hard towards. It is more than just entertainment for me because I understand that people are just people at the end of the day, all working one day at a time doing what we can do make the world a better place. Some people achieve that better than others. It is a way that I can also do what I can to help make the world a better place to be, to be updated on the current news without going through main stream media, and to make sure these guys get their paycheck to full their creativity. Thank you Markiplier and thank you Youtube for being an outlet in which this kind of thing can take place.